Emory University has created a new visually bold and engaging online center that brings together rich, multimedia content in a single platform with the ability to reach audiences directly through an array of media channels. 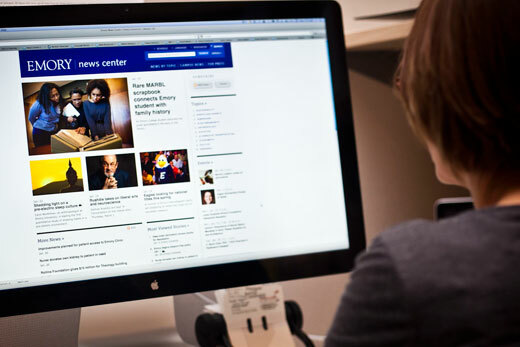 The Emory News Center (www.news.emory.edu), which launched Jan. 26, offers new online features and services for the approximately 4 million visitors to the University’s site annually, including members of the Emory community. “The News Center is an evolution of Emory’s web presence that keeps us up to date with technological and cultural changes, including the fundamental shift in the way people get news,” says Jan Gleason, executive director of university marketing and head of the steering committee that developed and implemented the News Center. “The News Center provides a space for us to combine the best of Emory’s news and events channels into a single, dynamic site that presents a compelling picture of Emory,” says Gleason. • Aggregating top news and branded feature content that will help create a more unified and compelling voice for Emory. • Offering an enhanced campus news focus that leverages Emory Report’s brand and content as a primary news source for faculty and staff. The News Center represents the next step for Emory Report’s evolution as an online-first publication. It will supersede the Emory Report website, which can still be searched online. The Emory Report eBulletin will distribute highlights of the latest news, events and announcements from the News Center. • Providing a platform to display Emory content that all of the University’s online promotions can point to—including blogs, social media, emails and ads––as well as providing a content-rich landing page for people who arrive at the University’s website through content searches. • The ability to tag content and group related content around particular topics. The News Center will provide more than 160 topic-based RSS feeds thus increasing consumer engagement and tailoring delivery to key audiences. • The design will give visibility to many of the stories that happen across campus, drawing together diverse and global stories from a variety of sources and provide rich authentic content and make it relevant to millions of online consumers. The News Center was developed and implemented over the past 18 months by the Office of Communications and led by a steering committee including John Mills, online executive producer; Jill Hennecy, senior online producer; and Nancy Seideman, associate vice president, university communications. Erica Endicott, graphic designer, Emory Creative Group, and Wendy Darling, Woodruff Health Sciences Communications web development specialist, also played key roles in the News Center’s development. The division worked in partnership with the Office of Information Technology’s Web Design Group in developing the customized Cascade site led by developer Emily Porter, OIT senior web developer, and Rachelle Willoughby, senior manager, web development, Research Health Science IT. The Communications and Marketing team conducted extensive research in developing the News Center including a review of the latest thinking regarding content consumption and direct audience reach and participation.